What kind of conservative is Doug Ford? Here's a look at where Ford stands on issues compared with the views of the average PC supporter who filled out CBC's voter engagement survey. How conservative is the Progressive Conservative leader? And how conservative are his supporters? What kind of conservative is Doug Ford? That is the question on the minds of many voters in Ontario as the Toronto businessman and his Tories prepare to form a majority government at Queen's Park. The former city councillor is often painted with a populist brush, and many of the commitments he unveiled on the campaign trail have a populist bent: $1 beer promotions; a 10 cents per litre cut in the price of gas; and a promise to fire the entire board of Hydro One, among them. But the PC Party of 2018 is a rather large tent, often beset by factional infighting. 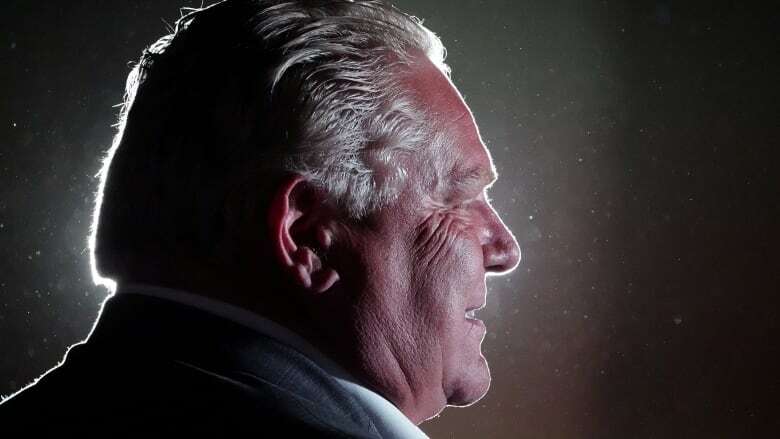 For evidence, one must only look to the fraught leadership campaign, which Ford eventually won, that pitted more progressive elements against staunch social conservatives. And now that he's secured the premiership, he will be expected to govern for all Ontarians, regardless of what party they voted for. Below is a visualization of where Ford stands on issues compared with the views of the average PC supporter who filled out CBC's voter engagement survey . The visualization shows the position of the average Progressive Conservative voter on each of the 30 Vote Compass question and compares them with Ford's and the PC's position. Party responses to each of the questions are derived through careful research of the party platforms complemented by a consultative process between the academic team and the parties themselves. We determined "left" and "right" by looking at how each question mapped onto people's declared self-placement on the left-right spectrum. Every point to the left of the dotted line means that the average voter is more to the political left than the party on a given issue, and vice versa. Vote Compass data has been weighted by gender, age, education and country of birth to ensure the sample's composition reflects that of the actual population of Ontario according to census data and other population estimates. The findings are based on more than 450,000 respondents who participated in Vote Compass from May 8, 2018, to June 7, 2018.